We are the Southampton Hydro Team, a group of undergraduate and postgraduate students from various courses within the University of Southampton and Southampton Solent University, and our goal is to compete in the HydroContest. What is the HydroContest ? The HydroContest is a marine engineering competition featuring teams of students from universities across the world. The competition is organised by the Hydros Foundation and this year will take place in St Tropez in France. The 2017 event comprised 23 teams from as far afield as Colombia and Malaysia. In order to compete, the team has to design and build two boats. These vessels then compete in three races: the Lightweight, the Mass Transport (also known as Heavyweight), and the Endurance race. The contest challenges the teams to work towards the Hydros Foundation’s goal of promoting maritime efficiency in all forms. The Southampton Hydro Team will be competing in the Hydrocontest for the fourth time since its debut in 2015. We have learned a lot over the course of several Hydrocontests and this experience puts the current team members in a great place to make a real impact on the competition. We are all passionate for what we do in the Team and willing to innovate more every year to help in making the maritime industry more efficient and better for the environment. We estimate our budget for this year at around £6,000 for both the Lightweight and Heavyweight designs. Any additional money would allow us to improve our vessels with even more advanced equipments and materials, and do more long term investments, the given figures being for optimised costs. The University have kindly agreed to match fund your donations from the Fund for the Greatest Need. This means that for every £1 you donate we will receive £2! 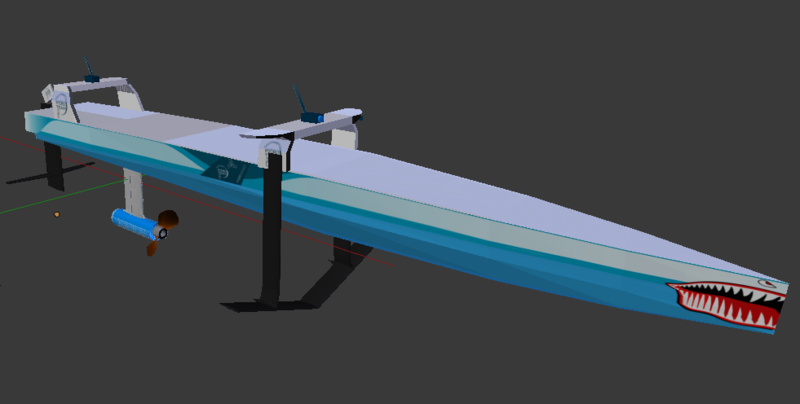 Since last year’s Lightweight performance was good (6th in the lightweight race, 3rd in the Endurance race), the Team has decided to further develop and upgrade last year’s, focusing its attention on designing higher-performance foils and improving the internal layout and structure of the hull. For the Heavyweight, the Team is currently working on a brand-new design, based on a technology so far never used in the contest. The Heavyweight vessel will therefore probably be more expensive to build than the Lightweight, since we will have to either buy or build all the components. The design, named “Project H”, is currently undergoing the last stages of design and is therefore still a secret kept by the members of the Team. The design, however, will be fully disclosed later in the year as soon as it is completed. There are several rewards for the people who fund our project, check them out!